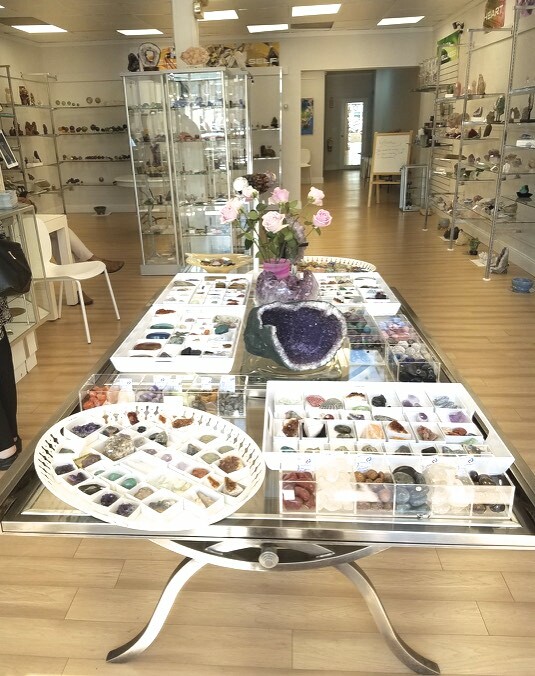 I was writing my blog about lessons learned in these first 3 months since new shop opened (Portal Crystal Gallery), when a whole separate section started taking shape in its midst, regarding a surprise lesson I'd learned in the process. It started to feel like too great a digression to leave in the other Post, so I created a new one here, to fine tune my focus in on the topic: pricing. As I've discovered over these past few months, we're not actually "too expensive." Did I ever say we were? Do others? I don't rightly know. What I do know, is that sometimes we create myths about ourselves, or others project theirs onto us. It's important to get a reality check, and recognize that the narrative (ours and hopefully theirs) is capable of change, evolution, and transformation. I do listen to - and learn from - what I do hear people say. I was saddened to hear one lady (during the warm Fall, when our front door was open) - she said to her little girl as they passed by: "we're not going in there - we can't afford anything." That is (and was) most emphatically not true. It's also not fair to us or the little kid to close off the opportunity of a visit, she might have found something she loved, after all. If in doubt, and if there's any interest - feel free to walk in - see what's really going on. Don't get stuck in what you think is going on. Take a chance on finding out what's really going on. We're a bit at fault here, because our first window display featured only our every best, big display pieces. People could be forgiven for assuming that's all we sold. It wouldn't take long to find out that our selection is much broader than that. I've gone to great lengths to create and grow my selection of $3-5 items (maybe with that little girl in mind). Being a Crystal connoisseur (or snob), this takes some humility and utilitarian practicality. I'm trying here, and I ask myself when I look at that section, "who can't afford this stuff?" If someone truly can't pay out just a few dollars, they've got bigger problems than my pricing, and maybe it's best they don't come in. But why frame it like that, so negatively? 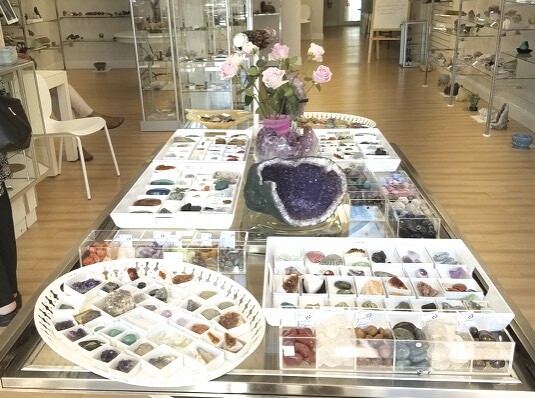 I prefer a Yes to a No, as a rule...which is why I've used the Portal Crystal Gallery coming into being to try to get to yes more readily...I want our shopping experience to work for everyone. I've also had enough window shoppers in my time to remind folks: "hey - it doesn't cost to look." Even just for the aesthetic experience, it's worth a walk around. This past weekend, I had someone come back to the store with a friend from the West Coast - not to buy anything - but just to tour the gallery for an hour and a half. I was quite honored that this was how they chose to spend their short visiting time, and on the holidays no less! An elderly woman this week marveled at our selection, said we were like a museum. I added: "I'd like to think so too - and these are pieces you can actually touch - unlike what happens at the Harvard Peabody museum (where everything is behind glass)." Another affordable innovation I've integrated into this store has has been the special "price-bin main-table," which is right there as you come in the store. Originally, I was going to put the sale section in the back, but it felt right to deliver it right up front. I'm always cycling in new items that I want to move, to make super affordable, and get out into the world. This table starts people counter clockwise, going to the right, as they walk around it. We commence with $8 items; and then move on to $10; $12; $14; $16; $18; $20; $24; and $32. I have 10 easy price points you can get to with a five, a few ones, a ten, and maybe a twenty. That's pretty approachable, if you ask me. And presumably - I think I can say this with confidence - it's not breaking anybody's bank! 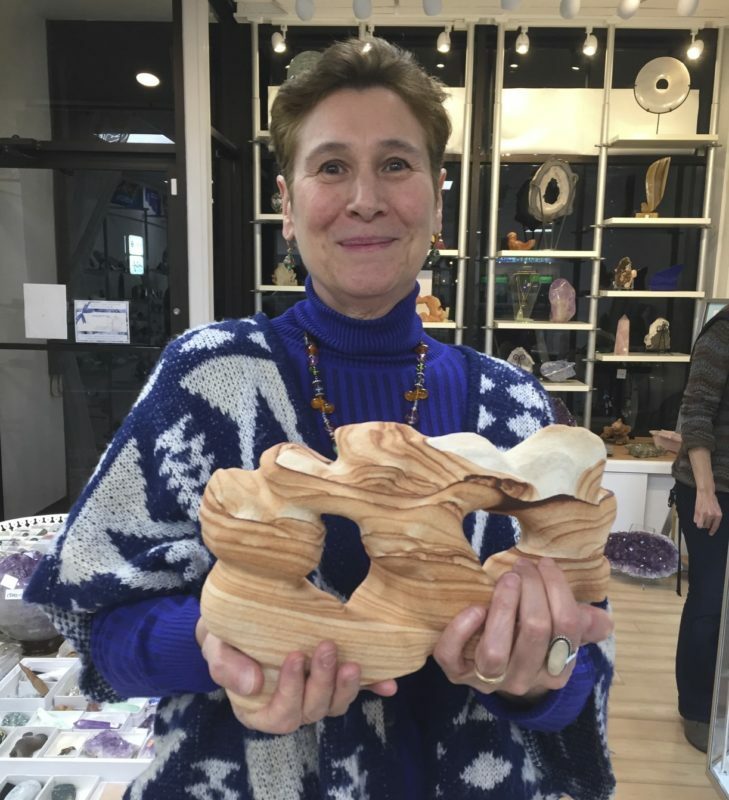 A favorite customer, with a sandstone power blasted sculpture from Utah, reminiscent of Arches National Park and the like. There was a time when I carried nothing costing less than twenty dollars at the shows I was doing, a few years ago. Since then, I've turned away product lines that go up past $500 as a matter of course. Most of my items are under $100, I want to make everything affordable. WHAT ABOUT THE MORE EXPENSIVE ITEMS? Those that do dip higher, are well worth it, for a variety of reasons I can easily explain. Try me sometime - pick out any item up in the store and ask me - "how'd you come up with this pricing?" 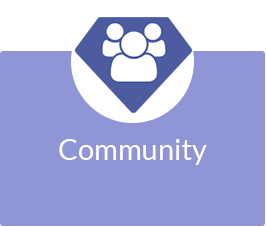 I want our numbers to make sense, and I want our numbers to be accessible to most people. 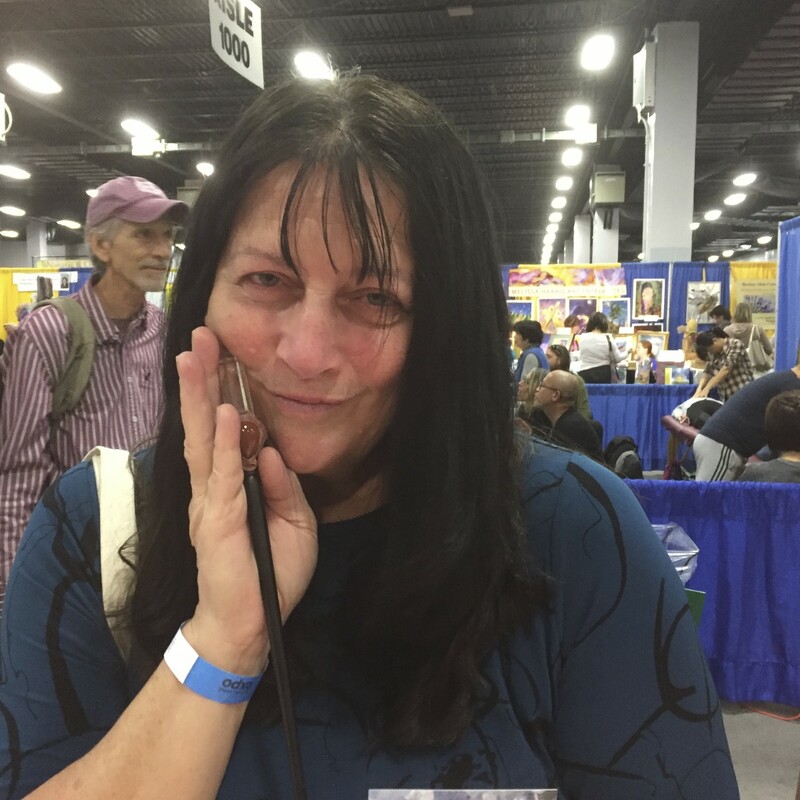 Fortunately, I've learned this Fall that even some people who aren't even collectors or Crystal lovers per se...they understand. This incredibly colored heart is $350; they said "I'll save up for it." That cluster's $1200; "okay, I'll put $200 down on it." Sensible replies to sensibly priced items. By having cheaper items abundantly on hand, people can easily comprehend why the more expensive stuff costs more, it becomes obvious! This is truly a profound point, let me break it down some more. When someone sees something for $50 or $500 and balks - I can easily show them the same type of stone for $5 - and they can figure out intuitively what the difference is. Allow me to go a bit deeper into this. You really can't underestimate how central (and persistently) Buyers and Sellers consider pricing. I use these blogs as an opportunity to flesh out my own thinking, and try to make it transparent for to all. I'm happy to share the behind-the-scenes process that goes into every detail of our offerings. B) Each item is priced based on what I think it's truly worth (something I know automatically, for every stone I pick up). C) So long as my optimum price is anything around (or preferably over) my purchase cost, we're good! What are the item's metaphysical qualities (is it "stronger" or "weaker" in this capacity)? How easily can I find or replace this piece (ie. find another like it)? 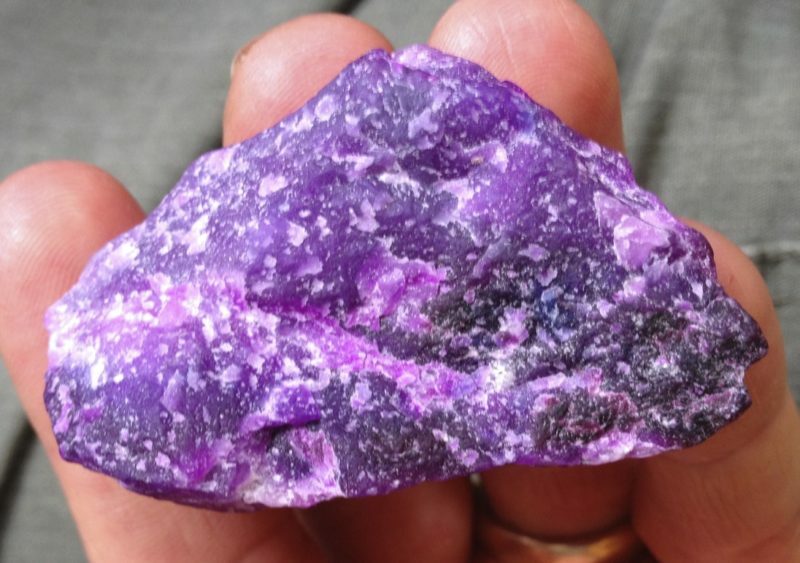 Perfect Sugilite specimen, who has this type of stuff? While I've found some advantageously priced items at other Crystal shops, I have plenty of accessibly priced specimens myself, and a number of quite unique specimens (things you don't even find at the trade shows). I specialize in carrying the latest trendy items (carved Selenites, Grape Agate, for example); but also in having a sampling of finds dating back years, which I know is quite unusual. It's because I'm not in such a rush to sell out of what I have, that I have things which might have been abundant, but are now more uncommon. I'm happy to wait for the right price (and the right buyer). I also go deep - you want real Nephrite Jade or natural Citrine - I have both - and in quantity. Given the lack of awareness of what is truly special (geologically) in this neighborhood (Arlington, where my shop is), I find myself dropping prices on items that would make some collectors drool, simply to adapt to the understanding of the buying public at hand. 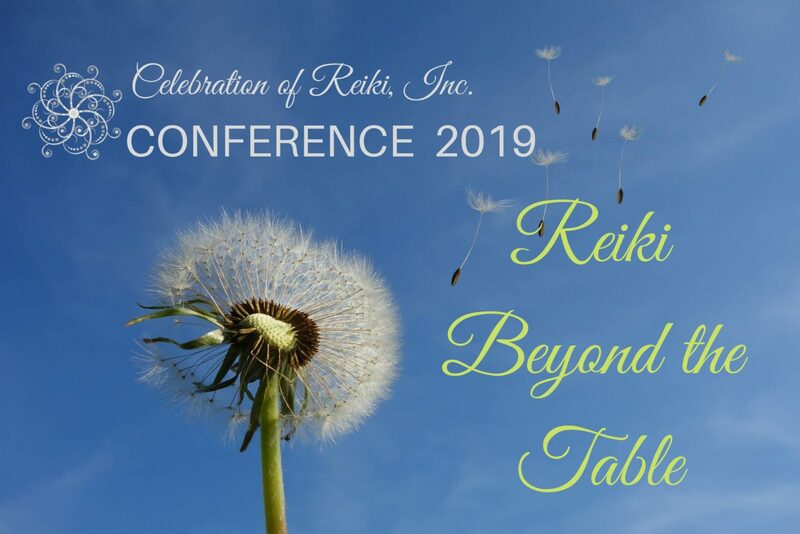 I want folks to find awesome deals and outstanding Crystals right in their backyard. I'm happy to explain to folks what a great find (or deal) they've just come across! "When in Rome" as they say - and that applies not only to adapting to your immediate community clientele - but it also applies to fitting into your larger community: other stores and suppliers who sell similar product lines in your region. I can't always price match. Trying to can be like comparing apples and oranges. Ebay warns me (with a new suggested pricing email) some of my items might not sell. They show me someone else's Lemurian for $45 vs. mine for $450 - but how can their algorhythm understand the difference in quality? Just because what some people call Lemurians sell for the $45 or $4.50 doesn't mean that all Lemurians ought to fit into that price bracket. People can be like that too - they'll say "I can find that for less" - but when I challenge them to produce a photo or show me side by side (which would reveal the difference in relative awesomeness), they always back down. I'm certainly open to being comparable - negotiating as possible - but ultimately, there's a reason I arrive at my SRP (suggested retail price), which should be respected, or at least understood. I've been the exclusive Crystal seller at events, and I've sold at Rock shows where everybody's selling "the same thing." The beauty of this market - and of my survival - is that no two stones (unless they're generic tumblers) are truly identical. You might find that stone somewhere else, but you won't find this stone anywhere but here. 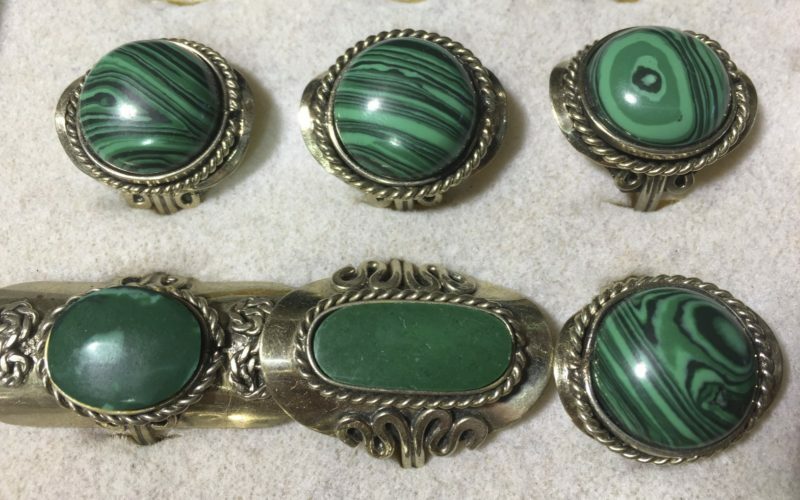 These lovely rings are recently fabricated facsimiles of Malachite - entirely plastic - and available (at a vacation gift shop I visited in Florida) for just $7.99. Not Sterling either. A real Malachite ring in Silver should be several times this cost (and with good reason). WHY EAT AT LEGAL SEAFOODS WHEN YOU CAN SPEND A FRACTION AS MUCH ON A MCLOBSTER ROLL? I can see why some people think like this - to them it's all the same - I mean: some wine bottles go into the hundreds...wine is wine...why not enjoy an eight dollar bottle instead? Well, if it were only that easy. Even people who buy $8 wines or drink Bud Lite (I imagine) understand that a craft bear or award winning wine might be more interesting (or different, at least). Still, I've found at some shows that people will spend $5-30 regardless of what it is they're getting. A big Rose Quartz bowl for $80 (however roughly hewn) is more enticing than a small, finely crafted one with thin walls for $100. My response is to deliver great specimens for bargain prices while also developing my collector level selection for those who can discern the difference (and logic for spending more). LOOKING DEEPER AT "FAIR MARKET VALUE"
What is the larger value of having a place like this that you can go to anytime (open 7 days a week)? Portal is perhaps the only metaphysical shop in the region that puts Crystals front and center, primary to the operation. We don't do books, we don't have trinkets, we're the real deal. Some online, and especially retailers in NYC have been known to charge way more than we do. I can't speak to the West Coast, but imagine Sedona. I love it when folks send me pix from these places, and the learning that happens inside, when they see 10 and $20,000 items...now THAT'S expensive...but for what it is, it's worth it, no?! I'm astonished by the outliers I find in many shop. I ask myself: "why are they charging all that for this?" or "whatever possessed them to stock this forgettable item?" Everytime I leave a wholesaler, I'm skipping with joy because of what I got, and even happier that I left the rest behind. Someone has to buy (and sell) that stuff...but not me. My goal is to have every single piece be a stand out - certainly they were to me - I'm only interested in carrying the best, whether it be a $3 tumbled stone, or a $3,000 museum piece. My hope is that folks find our spot, and recognize that it's well worth the journey - whether they come from down the street - or whether they travel from far out of state. What we have is definitely worth traveling for, even just to look! I don't buy by the lot. This isn't a commodity business, where I'm just trying to "turn" or "flip" product, like a condo - selling cell phones or even like some big Crystal sellers - who are mostly interested in moving volume. I hand select every stone I carry. I like to tell people - "before you deliberated about buying this piece, I did the same thing before you. I decided I couldn't live without it either, just like I'm hoping you'll decide right now." The relationship is really more important than the transaction. Just recently, someone bought a $12 item and commented that I "clearly have an eye," and it's not uncommon for people to remark at how carefully chosen and displayed our pieces are. I had one guy pay full price for an item, even after I offered him a discount. That takes Soul. He said to me: "you've got your costs, I appreciate what you're doing, I want to support you." All music to my ears! Compared to most upwardly mobile - or any mainstream profession - we're not getting rich off this venture. I don't get paid hourly, no matter what. 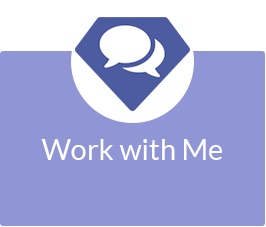 It's a LOT of hard work, anyone who's worked closely with me can attest to that. Plus, recall that I have an enormous hole to dig myself out of, what with all the renovation expenses incurred this year. This is a passion project, to be sure, as has been my entire life (whatever I've done). I learned - after getting Cancer twice in my life - that Life is too short to waste time doing anything other than what really inspires your Soul. Not everybody gets to make that choice. I have to be grateful and honor this opportunity I've been given. Another happy customer, in love with the wand she just bought from me. This exercise - not just the store itself, but this blog too - has taught me what's truly important. Ultimately, I want people to be drawn to Crystals because of the personal bond they create with them. I'm happy to teach you how to do it, if that doesn't come naturally. I may not always convey this as clearly as I should, but it's really important that people's relationship to Crystals not be mitigated exclusively by what that little white sticker tells them it costs! To have it otherwise (becoming all about the price) would feel so empty and superficial to me. I hate to say it, but that's such a 2 dimensional way of looking at Power Stones! It doesn't do you or the rocks any justice! Ultimately, what I'd like for people to do is to fall in love - and it happens often enough that I know it's possible - and then I'm happy to part with the piece (whatever it is, even some of my personal pieces). People often ask "is it hard for you to give up these precious stones?" I say no, not at all, not in the case that they're truly wanted, and headed towards a good home. When price is no longer the main issue - 'cause somebody's bonded to a Crystal itself - it makes me much more willing to negotiate its price downwards. 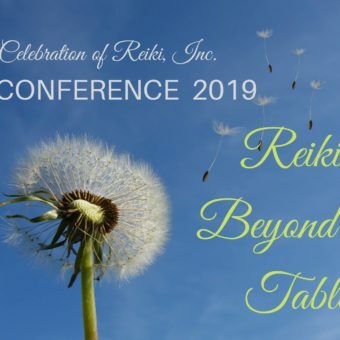 If someone has formed a connection with a Crystal that I can feel and see - they're more likely to enjoy bigger discounts than people who begin with an agenda of getting the price down - as their primary or sole objective. Why not get the piece of your dreams - and the price of your dreams - I'd certainly like to make both happen for you. Nothing turns me off more than people wanting to pay bargain basement prices for items that are anything but bargain basement items. Nothing feels more rewarding than people who appreciate the value of what I'm providing - they "get it" - and they're willing to put their money where their mouth is. 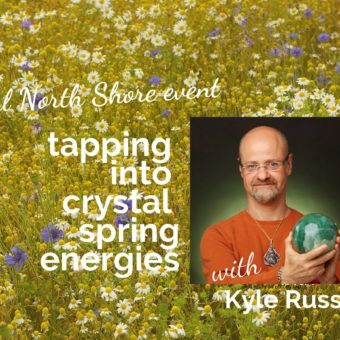 Kyle Russell has been working with Crystals since 1987 - buying and selling - but also doing work on and with people. In more recent years, he's systematized his understanding into a method of understanding and teaching what he knows to the general public. 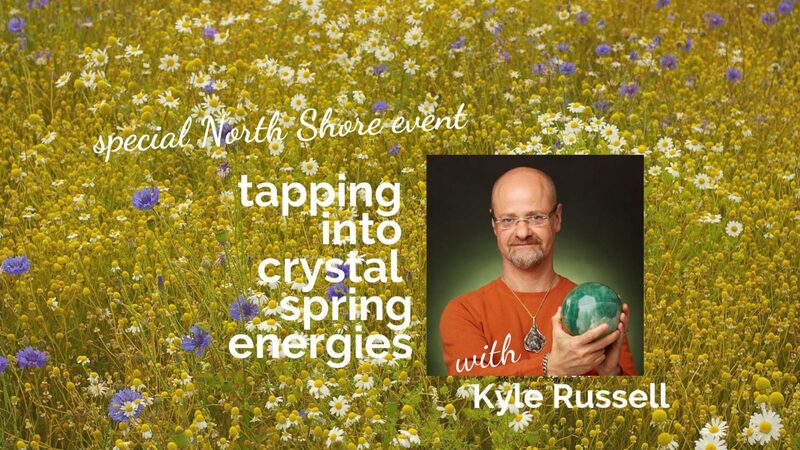 By speaking at events - having a YouTube channel named after his modality (Crystal Concentrics), printing a Crystal card deck, and hosting Meditations and Retreats - Kyle has really been putting word out about his unique perspective on Crystals these past 5 years. Learn more on this site; his For Sale items site www.PowerStoneCrystals.com; at the brick and mortar store site: www.PortalCrystalGallery.com. wonderful blog, kyle. zach and i appreciate your “soul” and it was quite a treat for him to see the next version of your chapel of energies. we came to arlington to specifically choose a christmas present of his choosing and we spent 2 glorious hours crystal gazing (if you will !). both of us loved it and will certainly be back. zach has quite an understanding of the power for an 8th grader and, with my interest to encourage him, he may just have found his niche and i support this. this is a kid who “gets” energy…isn’t that lovely?